Every once in a while, you come across something special; something so utterly splendid that you would be remiss, with a lifetime of regret for passing it up. Meet Rose! How could I not want to take her home! The opportunity to restore a Victorian fainting couch was too tempting to pass. The price closed the deal! Follow her journey from start to finish. Throughout this project, I ask and encourage you to comment here or on Facebook/Instagramn/Twitter. This is a very personal project for me, one I want to share with you. I hope it inspires you to believe that you can do this too! Don’t let the tufting scare you. We walk that road together. 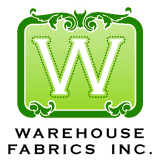 Other than hand sewing, this is a NO-SEW PROJECT. 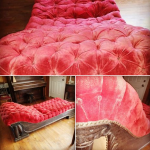 I’ve wanted to find a Victorian fainting couch for years. I’ve been frustrated in my efforts though, because finding one in decent condition, cost realistic, in a location that doesn’t require shipping, and in a style I want, chiefly Neoclassical or Rococo Revival, just wasn’t happening. Yes, I’m picky. Don’t judge me. larger than life. I’d swear I heard angels singing. I mean, I was lost in her splendor, a goner. Asking his opinion was not an option. This was happening. We were driving to Iuka on Labor Day, so plan accordingly. His angst was unmistakable. So, you know the Passover oil that miraculously lasted for 7 nights? That couch, at nearly seven feet long should not have fit in my SUV. But with knees up our noses and the steering wheel sandwiched into my husband’s belly, we did it. It wasn’t pretty, but it made it! 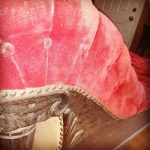 What’s special about a fainting couch; excuse me, a Victorian fainting couch? A brief history lesson here. Stay with me! I promise there won’t be a quiz! The Victorian Age is named for Queen Victoria. Miss Vicky ruled from 1837 until her death in 1901. Bless her heart, she took the crown at the tender age of 18 and set the standard for refined, sophisticated style in society and fashion. Like any cultured young woman, etiquette was primary. Etiquette, most notably seen in social grace, was recognizable in a woman’s attire and her form. As a member of the ruling or upper class, her attire reflected finery; poise, posture and attention to detail, even a woman’s silhouette reflected her status. The corset was first introduced in 1500’s. While it’s style changed with fashion, its function remained constant, that of defining a woman’s attributes. Like hemlines, waistlines moved up and down with the times as well. With the end of a less restricted attire and a lowering of the waistline back to natural, the corset evolves again to emphasize a small middle, high bust and wide shoulder/hip, a.k.a. an hourglass figure. The thin silhouette of a corseted woman distinguished her from the working class whose attire could not constrict movement. At the height of social grace and fashion, the corset reigned among the upper class. A mark of sophistication, beauty, “breeding”, the wearing of a corset was a clear distinction above the lower masses who frankly, had no time for such arrogant frippary! Although a tightly laced corset produced the illusion of health, it was anything but healthy. A woman, even a young girl was prevented from sitting properly or relaxing, from eating, digesting, and resting. In fact, a woman often had to don her bonnet first and then be dressed as a result of such tight lacing. For once a woman was laced, she was laced! It is not surprising, that in addition to not being able to bend, such tight lacing might make the ability to breathe challenging as well. Recall that social grace was paramount. A woman would not be caught or seen swooning for anything other than perhaps the sight of mayhem or a handsome suitor. Making a hasty retreat when shortness of breath or low blood sugar from the inability to eat was overwhelming meant having a place to retreat to! Fainting rooms provided the solution for a woman who had the “vapors”. Although she might have a fainting couch in her private quarters, time wasn’t always on her side. The fainting couch allowed her to quickly retreat and recline without having to undress, sit up or lean against a chair arm. She could comfortably recover and return without help. 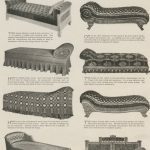 The Victorian fainting couch, recognizable in contrast to a chaise lounge, has a low, arched head with or without a backrest, and no arms or only one. The couch featured here is in the Neoclassical Revival style, a less ornate style with softer carving, and some elements of Greek and Gothic revival like columns and flourishes. Designed for quick retreat, the fainting couch enjoyed a long service history. 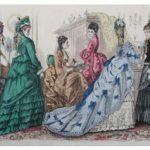 With the influence of the suffragette movement that peaked at the turn of the century, corset wearing began to dwindle, fainting rooms were no longer necessary, and another social era passed on with little notice or fanfare. And that’s a question we’ll answer next time!